We are providing to our valued customers a supreme quality range of Warehouse Security. This is also known for their durability and compatibility. Customers can easily avail this services from the industry at attractive prices. Arrow Global Logistics Pvt. Ltd.
Our access to reliable and committed professionals enables us to offer Warehouse Security Services to our esteem clients. We train them on various aspects to handle each and every activity related to the respective field of service. Thus, they deliver their services with high perfection and discipline. Offered services can be availed at budget friendly price. Lambert Security Management Pvt. Ltd.
Our Warehouse Security Guards and diversify security guard services will permit you to secure warehouse property and defend warehouse material goods from theft or destruction. It is very general today for clients to be exposed to interior warehouse security theft or internal contraction. 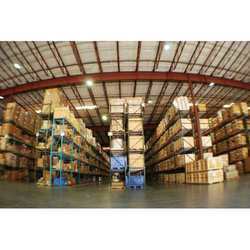 A warehouse is designed for ease of access and loading and unloading of materials. But vandalism and theft are two of the major security risks to storage and distribution facilities because of their remote location. Warehouses and distribution centres are particularly worth securing, as being placed in remote areas means they are more likely to get broken into. Industrial, manufacturers and warehouses facilities face a countless of security problems. Our security officers have solutions to protect against theft and pilfering, counterfeiting, sabotaging, trespassing, activist disruption, destruction and contamination. We provide special security squad for mega-events, exhibitions, cultural Programs etc. we provide supervise parking and direct traffic provide Securities at the parking area at all entry and exit points and station plain Clothed guards at various points to provide maximum protection and Security.